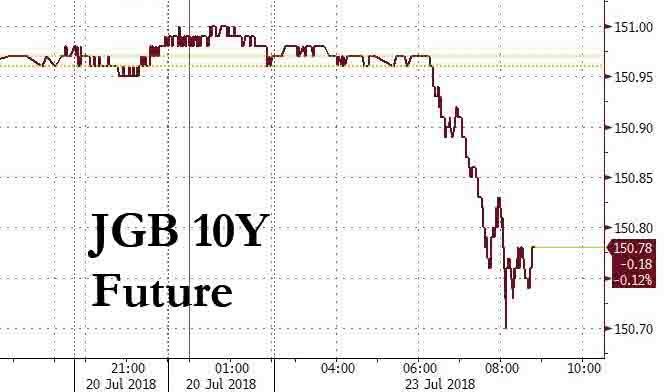 It's not just US Treasury that have taken a step lower following Trump's latest comments which have whacked both the dollar and US equity futures: Japan's 10Y JGB futures are also sliding as traders cite a report in JiJi report that the BOJ will begin a full-scale investigation to mitigate the side effects of its yield-curve control policy on bank profitability and government bond trading, Bloomberg reports, which suggests that the BOJ may seek to "kink" the curve to the left of the 10Y in hopes of achieving a "beautiful steepening" to roughly paraphrase Ray Dalio. Like in Europe where between NIRP and QE the yield curve has been so flat has been hurting bank profitability (with some bank, most notably Deutsche Bank complaining vocally about the ECB's policies) similar concerns have spread in Japan where both banks and pension funds have been agitating for at least some yield curve steepening to increase NIM and support bank profitability. As shown in the chart below, the JGB 10-year future - which barely trades on most days - has dropped sharply from 150.98 highs to 150.76, the lowest level since June 20. The report comes hours after the latest latest data from Japan showed that inflation picked up just slightly in June, meanwhile the BOJ's preferred CPI ex-fresh food and energy prices rose just 0.2%, missing expectations of 0.4%, and reducing speculation that the BOJ may start tightening its ultra-loose monetary policy and will likely cut its inflation outlook again. 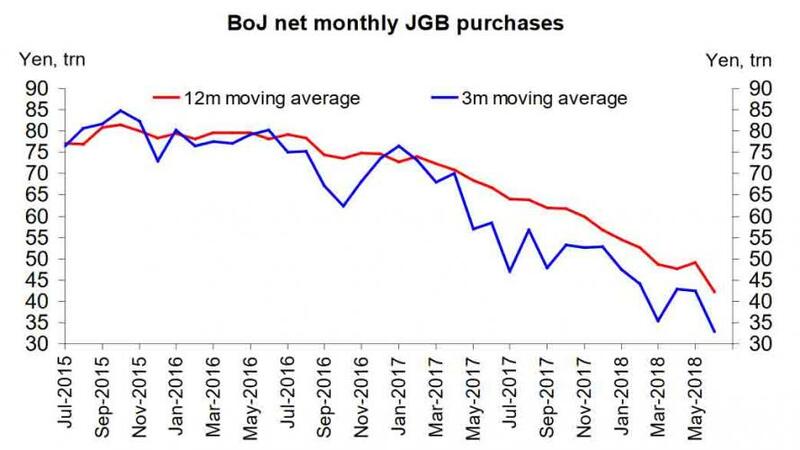 Which, of course, is a bit of a paradox because as the chart below shows, the BOJ has been actively reducing its bond QQE purchases in recent months. Earlier, BofA Japan economist Izumi Devalier said on BBG TV after the inflation data that "in terms of actual changes to YCC, the 10- year target or of course the negative interest rates, I don’t think the Bank of Japan is anywhere close to signaling a policy move" which is also strange as two days ago the BOJ trimmed purchases in both the 10-25 year and 25+ year buckets.